Actively engage with clubs and individuals to help further develop their potential customers, membership, volunteers and staff understanding whilst aiding forward planning reflecting and reviewing from various backgrounds and experiences to maximise future projects uptake as well as impact within the club's/individual's work force and aspirations. 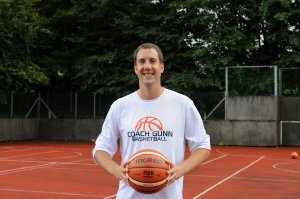 Mark has coached and developed basketball at various levels across the performance pathway from minis, community and club teams to the county, regional and national representative level with a specialism in the female game coaching at the highest level in the UK in the Women's British Basketball League with Leeds Beckett University. Off the court Mark, started in sports development being self-taught whilst at university and working in York (2000-2009); progressing on to working for Bradford Metropolitan District Council Sports Development Unit as a Community Basketball Coach (2009-2013), followed by working for Leeds Force Foundation (now City of Leeds Basketball Foundation) as Club & Community Development Manager with projects across North & West Yorkshire and Lancashire (2014-2016) and then becoming self-employed (Coach Gunn Basketball) delivering and developing basketball in the school and community environment across Lancashire and Yorkshire 2016 to date. 18 years of planning, delivery, evaluating, developing and importantly sharing mistakes personally made with others to encourage further learning.